Earth's interior reveals itself from probing and prodding at the surface, by making inferences from the composition of meteorites, and by other indirect means. 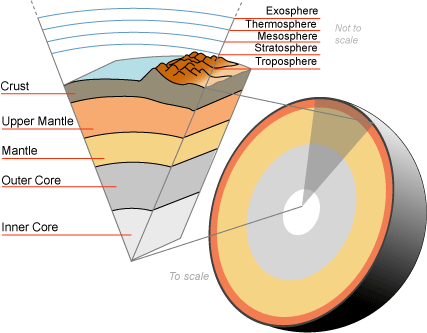 Earth's core has been widely imagined and fantasized in fiction. launch from the vast unknown that is Earth's interior into tales of adventure where characters encounter the unexpected. I pointed towards the center of the earth. 'Into the cellar?' exclaimed the old servant. 'No,' I said, 'farther down than that." Idealized depictions of a cutaway section of Earth's interior lure us to the false comfort that knowledge is set in stone. Knowledge of Earth's interior is a working model. Knowledge is a working model because it is meant to undergo revisions as new information is discovered, analyzed, corroborated, and peer-reviewed. For example, the hydrophilic mineral ringwoodite recently discovered from Earth's mantle, indicates there could be a vast subterranean water repository as large as the world's oceans (see Hydrous mantle, Nature). With evidence to corroborate this discovery, our working model might eventually undergo revision. Rocks - By examining rocks erupted from great depths via volcanoes, we make inferences about the composition of Earth's mantle. Meteorites - From the composition of meteorites that have struck Earth we make inferences about the composition of its interior. If we assume that meteorites originated from protoplanets that underwent a similar genesis to Earth, we make deductions about the composition of Earth's core and lithosphere. Stony meteorites are believed to be similar to Earth's lithosphere, while meteorites composed of iron and nickel are believed to be similar to Earth's core. Seismology - Analyzing earthquake-generated waves, the mechanical disturbances that travel great depths into the interior, we make inferences about Earth's interior structure from changes in velocity of p-waves and s-waves. "This lucid explanation of the phenomena we had witnessed appeared to me quite satisfactory. However great and mighty the marvels of nature may seem to us, they are always to be explained by physical reasons. Everything is subordinate to some great law of nature." At the Earth's Core, Edgar Rice Burroughs, A.C. McClurg, 1922. Exploring the Earth's Interior, SOEST at the University of Hawaii at Manoa. How do scientists known what the center of the earth is?, UCSB Scienceline. 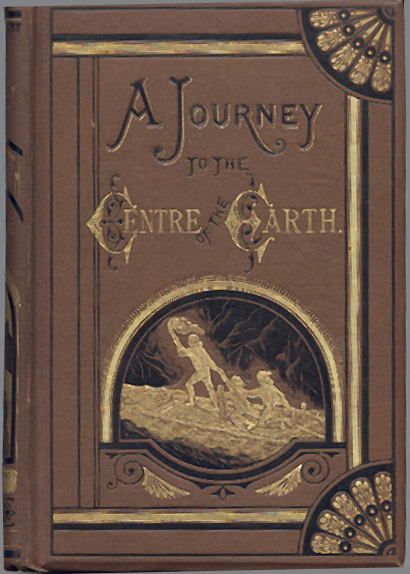 Journey to the Center of the Earth, Jules Verne, 1871. Subterranean Mystery, GrokEarth, 15 March 2014.